This necklace was the first fully beaded piece in my Geometric Beadwork Series. 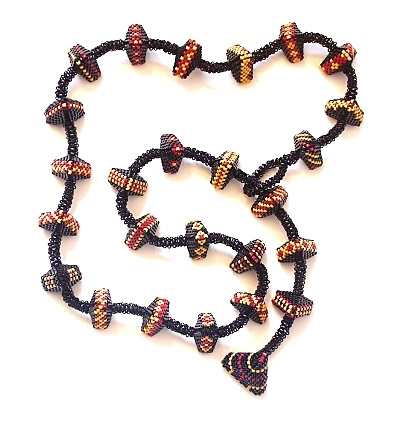 It is a peyote stitch rope that is beaded straight from one end to the other, incorporating increases and decreases to give the impression of beaded beads. It uses black as the base colour and red and yellow as highlights. Each 'beaded bead' has a different pattern on its side, there are 26 different ones in total, including the large one used for fastening. I made up each pattern as I beaded, and it soon became pretty hard to come up with something new that worked in a 5 row, 6 bead space! The necklace can be worn with the fastening looped anywhere along its length to change the style. As I made this, I like the look of the 'beaded beads' and wondered what they'd look like closer together, and in a different shape- so Geometric 5-4-1 was born. I later beaded another necklace, the same as this, just changing the colours to see how different it looked.